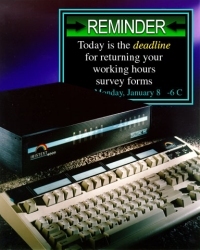 NOTICE: The IRISTEXT 4000 model has been discontinued. It can be replaced advantageously by Tellimage-MP. Please click here to be redirected. Click here to see options, or here for second-hand I-4000 units still available. Those who communicate messages are always in search of attractive ways to carry their information more effectively. IRISTEXT answers that need for immediate employee communication as well as the need to display information in public areas. IRISTEXT is used to rapidly reach the greatest number of people. It broadcasts information through a network of video monitors or TV sets located in the most frequented areas. IRISTEXT is ideal for information that needs regular updating. IRISTEXT's integrated design allows non-technical personnel to quickly create and update attractive messages combining text on pre-composed resident backgrounds and graphic illustrations. All composition happens in real time (WYSIWYG) with easy-to-use editing features. Data is stored in nonvolatile memory for unequaled reliability and fast retrieval. With the broadcast-scheduling feature, information can be programmed to appear just at the right time. Events can be scheduled by date, hour, minute and second to control a message presentation. IRISTEXT can control an unlimited number of other IRISTEXT Video Billboards by local network (LAN), modem or local cables. Many plants or branches can be linked to receive and display information. IRISTEXT Video Billboards are dedicated reliable 24x7 equipment designed specifically to accomplish a very precise task, the editing and broadcasting of information. The IRISTEXT 4000 professional line rounds up 6 upgradeable models to meet various needs and requirements with a wide choice of functions and options available. Some models require a Personal Computer for editing while others are completely stand-alone. All models come with pre-composed resident graphic backgrounds, a clock/calendar, an express message display and unlimited telephone support for 2 years. Dual channel configuration is available for real time composition and full off-line editing of pages without interrupting broadcast. These models at the top of the IRISTEXT range, can broadcast digital photos or any ".bmp", and ".jpg" images created on your PC. The MPEG-II option provides MPEG video broadcast. Click on the photo for Tellimage detailed information. 2 Models: Tellimage (Base unit), Tellimage MP c/w MPEG-II, PinP+DVE and I-Audio options. 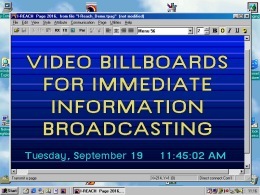 One channel video billboard, used for broadcasting messages created on a computer using the I-Reach software. The user can edit his pages and schedule on a PC running Windows. Everything is then transferred in the I-4000-We through the PC serial port**. Once the transfer is completed, the computer can be shutdown, and the I-4000-We will broadcast and update the content as specified in the schedule. The I-4000-We can be sited locally or remotely if the I-Relay (LAN) software or a modem is used. One channel, professional video billboard with more functions and options which may include high resolution digital pictures and sound. This stand-alone unit, with a keyboard, can edit or broadcast messages without a personal computer. 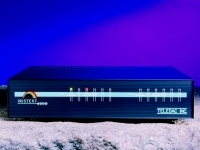 Same as the IRISTEXT 4000 Se, with a second channel for uninterrupted broadcast and full off-line editing. Upgradeable later to Tellimage level. One channel remote broadcast video billboard, same as IRISTEXT-4000-Se model but without editing functions and without keyboard. Broadcasted information has to come from an I-4000-We, Se, S2, I-MKII or a personal computer using I-Reach software. All options from the I-4000-Se are also available. Upgradeable later to Tellimage level. Required video monitor(s) not included. **Personal Computer required not included.